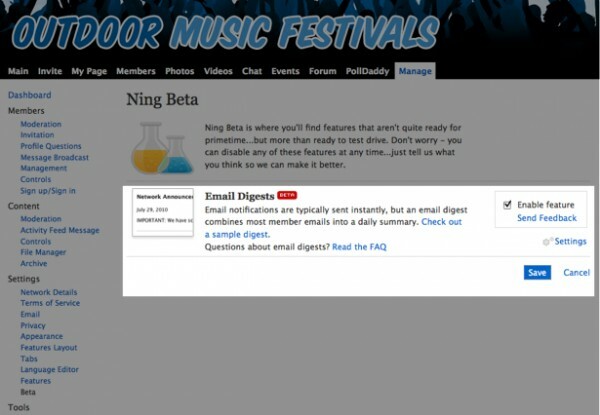 Many Ning Plus and Ning Pro Networks have the ability to take part in our Email Digest beta. This feature allows you and your members to choose to receive daily summaries of updates to content you follow, rather than getting individual notifications for each new activity. For a peek at what these digest emails look like and what they contain, check out this article. To enable the Email Digest feature on your network, head to theÂ Ning LabsÂ page under the Settings section of your My Network tab. To begin working with the Email Digests feature, check the “Enable feature” box and then the “Save” button. You and your members are now all set to begin opting in to this feature. ToÂ customize it on theÂ network, click the “Settings” link on theÂ Ning LabsÂ page to be redirected to the Email Settings page for your network. Here, you can add a custom header or include an ad that you’d like to have appear above the items in your members’ digest emails. Click “Save” when you’re done. 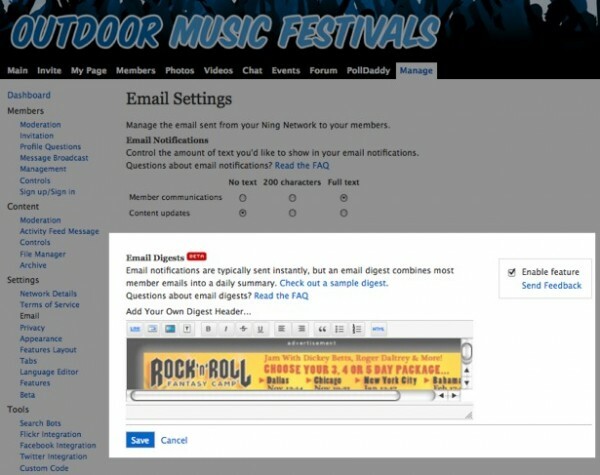 EnablingÂ this feature will allow you and your members to opt in to receiving email digests. By default, your current settings for receiving immediate notifications will remain in place. To activate the feature for your account, head to your Settings and click “Email” on the left. From your personal Email Settings page, select the option to receive “Daily” emails and click “Save” at the bottom of the page. 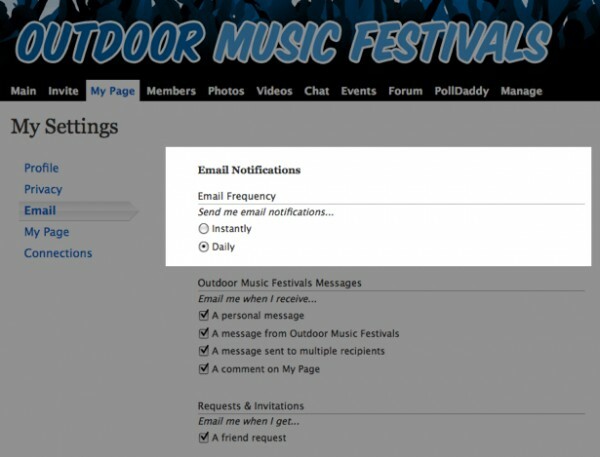 To begin receiving normal notifications emails again at any time, head back to this page, select the “Instantly” option for Email Frequency and click “Save” at the bottom of the page.